It was a week that could easily have been the undoing of our season, we approach the end of it with four points already in the bag and with a small chance of moving back into the play-offs if we can beat Lincoln City in this forthcoming game. Just when it looked like our away form had abandoned us, we take four points from two of the best home sides in the division. Just when it started to look like we were leaking goals at an alarming, we look to have solidified again. It’s not quite a come-back, but we look to be moving in the right direction with 12 games still to play. The biggest question mark at the moment is our lack of goals from open play over the past month or so. Of the four goals we have scored in the league in February, three have been penalties, which is obviously a source that cannot be relied upon when you’re chasing promotion. The integration of Jonson Clarke-Harris into the side, appears to have upset the balance between the front two, while Marc McNulty looks to have lost form slightly and Maxime Biamou shows little sign of adding goals consistently to his game. Additionally, Liam Kelly’s return to fitness has seen Tom Bayliss pushed into a wide position where he has less of an influence on creative proceedings, while Jordan Shipley appears to offer the side less when there isn’t a natural winger on his opposite flank. The bold thing for Robins to do against Lincoln would be to start Bayliss alongside Michael Doyle, play Kyel Reid from the start out wide, adding creativity to both the centre of the park and in the wide positions. However, it seems Robins’ natural conservatism as a manager will likely see Bayliss continue on the right flank and Reid deployed as an impact sub. In defence, Dominic Hyam deserves some credit for being part of a defence that kept one of the division’s best attacks to a clean sheet, however, I don’t think there’s much of a debate to be had over whether to restore Jordan Willis to the side. Hyam stood up well to Akinfenwa, but still lost more in the air than he won, while Willis dominated the same striker in the reverse fixture. Lincoln pose a similar threat via Matt Rhead, and we know Willis can stand up to that kind of striker, so that’s why he’ll be coming straight back into the side. Our last meeting with Lincoln was a rare occurrence for us this season, a game that we won after falling behind. A dismal first-half performance from the Sky Blues saw Lincoln take a deserved lead via man mountain Matt Rhead. However, Duckens Nazon and Jodi Jones took the second-half by the scruff of the neck and dragged us to victory. First, Jones fired an audacious effort from range and a narrow angle to level the scores up, before Nazon fired home a rebounded Jones effort to put us ahead. While Lincoln’s rise over the past 18 months has them on an overall different trajectory to ourselves, they are in many ways, a similar side to us having a fairly similar season. Having been one of the pre-season promotion favourites, Lincoln have intermittently clicked into gear before dropping silly points and find themselves on the edge of the play-offs at a key stage of the season. In terms of style of play, Lincoln are a fairly similar side to us as well. The core of the team is about hard work and keeping things fairly tight at the back. They don’t play especially pretty football, nor are they completely one-dimensional. The main differences between the two sides are that we have a more reliable goalscorer in Marc McNulty and they have pace in wide areas. Lincoln have probably been dogged this season by a lack of a reliable goalscorer, despite having strikers who are effective at other things. Top-scorer Matt Green is on 10 goals this season and can offer both pace in behind and physical power, but his finishing can be a little wayward. The hulking Matt Rhead has a deceptively good touch for a six foot four, 16 stone striker, but a lack of mobility means he’s not in goalscoring positions often enough. The only alternative is Ollie Palmer, who is a less effective version of Matt Rhead – although can still be excellent at this level on his day. Out wide, Ipswich loanee Danny Rowe has really caught the eye with both his pace and industry since joining in January. Harry Anderson, another pacey and industrious winger, has had a productive season with six goals and four assists. While Lincoln also recently signed Stevenage’s impressive winger Tom Pett, who possibly offers greater subtlety in wide areas. 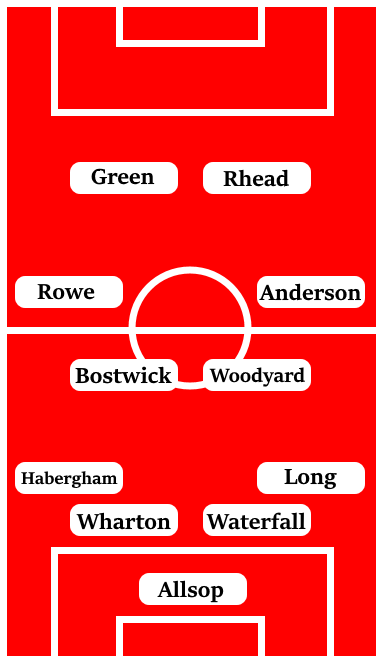 Lincoln’s central midfield options are also impressive with the hard-running box-to-box midfielder Alex Woodyard among the best central midfielders at this level. He’s likely to be partnered with the experienced, but also box-to-box, Lee Frecklington who has returned to the club after successful spells at Peterborough and Rotherham United. There’s also Michael Bostwick there to provide ballast, although he has been deployed in central defence of late. There is possibly uncertainty to exploit at the back for Lincoln after the loss of key centre-back Sean Raggett in January, who returned to Norwich after a loan spell, and an injury to January signing James Wilson who had impressed as Raggett’s replacement. Nonetheless, Luke Waterfall and Michael Bostwick certainly boast plenty of experience, while Blackburn loanee Scott Wharton enjoyed a productive loan spell at this level with Cambridge last season. They also have Ryan Allsop in goal, who had what can best be described as a mixed loan spell with us three seasons ago. This is the first of the three remaining games this season that we have against teams currently above us in the table. If we can navigate our way past this, then we have, in theory, a relatively favourable set of fixtures between now and the end of the season to nail down a play-off spot, or better. While Lincoln’s away form is relatively ordinary, they will be motivated by a large away following as well as the desire to bounce back from some poor recent results. This is going to be a stern inspection of our ability to build on the past couple of results. A lot rests on the ability of our attack to grab a goal or two, as I think our recent defensive improvements have shown we can keep things tight. I think we’ll be able to edge this game 1-0.